LAZY-HANDS thumbs-free tablet and cell phone grips by Kernelope Enterprises were created by Colorado inventors, Christine and Danny Potter. These device holders are thumbs-free grip attachments for tablets, eReaders, smartphones, clipboards, remotes, protein powder kegs, oversized coffee mugs, small tools, and other lightweight objects. 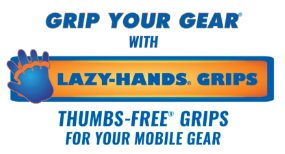 LAZY-HANDS hand grips for phones and tablets attach to the back of the mobile device or its case, and allows you to comfortably, easily, and securely handle the device with just one hand without dropping it. No more awkwardly gripping and pinching your smartphone, eBook reader, or tablet with both hands. The dream of curling up and reading a good book will come true with our hand holders for phones, allowing you to grip your phone, recline in any position, and relax while reading or using your device anywhere.